A nice combination of fresh summer fruit and pasta dressed with a light coat of vanilla yogurt to bring all the flavors together. So easy to make yet so full of flavor. 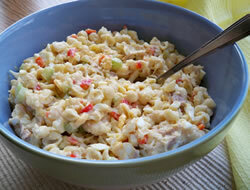 Perfect for all your summer get-togethers or a light summer meal. Cook pasta according to package directions; rinse with cold water and drain well. Set aside. Slice the strawberries, cube the cantaloupe and pineapple, and cut grapes in half. Go through the blueberries and discard any with blemishes. 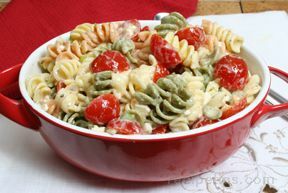 Combine all the fruit, along with the pasta, in a large bowl. Add the yogurt and carefully stir to coat the fruit and pasta evenly. Refrigerate to chill for at least 30 minutes before serving. "I loved this salad. 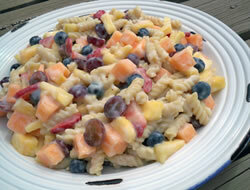 I like pasta and fresh fruit but had never combined the two. The vanilla yogurt was the perfect dressing for this salad. It was also very easy to make. I will be making it again soon!"